Saturday, Dec 1 - Christmas Tea for Reb's birthday & wedding shower for Liz! Monday, Dec 10 - Final in OT...when am I going to study for that? Saturday, Dec 15 - Single Adult Christmas Party with Comedy Sports! Monday, Dec 17 - Childcare Christmas Dinner at Guadalajara!!! That's my crazy 2 week run of Christmas madness. I just pray that I don't get caught up in all the parties and presents that I forget why we celebrate. May His birth bring you joy this Holiday season! Super Duper: doing pretty good on my Christmas shopping! My parents left Corpus today and headed to my oldest sister's, Katy, in the Temple area. They will stay til Monday to have lunch with Brady at his school, then they will head to Waco to pick Ashlyn up from school. 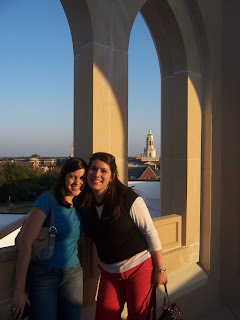 They were supposed to stay in Waco on Monday night with Kristy, Trent, Ashlyn & Cole. But Ashlyn told my mom she wanted them to spend the night for 2 nights. So my parents changed their plan to stay Monday & Tuesday night, and then head back on Wednesday morning to Temple to help get ready for Thanksgiving day. Well, this upset my oldest sister (whose house we are having Thanksgiving at) because she had wanted my parents to get back on Tuesday to help with some errands, cooking, etc. Kelly, my sister closest to me in age, was going to go down to Temple on Sunday and stay through Tuesday to hang out with the fam, cook, run errands, help with the kiddos, etc. But she changed her mind because she is trying to get her house ready to sale. So she stayed in Arlington to clean out closets, get new carpet, etc. So we won't see her till Thanksgiving day. Oh, and she's bringing her boyfriend, Brandon, who will join us for his first time for a big Berry family gathering. Oh, and he doesn't know that we have a mandatory Thanksgiving tradition of going around the table and saying what we're thankful for. And now Kelly is also slightly frustrated because Brandon's work schedule just got changed and he has Friday off, which she would like to spend with him since he's in his residency for med school so they don't often both have the same day off, but instead, will be spending with the day with my parents & I because we'll be staying at her house on Friday & Saturday for some good shopping! I on the other hand am sad because I had hoped to spend time with all the kiddos for several days, but Ashlyn has school til Wednesday, so they won't come to Temple til Wednesday afternoon. But I guess that will have to do. My sister, Katy, is upset about the time of Ashlyn's party because she has a dress rehearsal for the kids Christmas program that she is in charge of that Saturday morning, so she and they boys will be late for Ashlyn's surprise party. My sister, Kelly, is upset because she wanted Ashlyn's party to be the weekend before, which it originally was going to be, but my mom couldn't be there, so Kristy had to switch it to the weekend of the 7th/8th, so now Kelly can't be there. My mom is upset because Kelly is going on a girls spa retreat with her church, so she will miss the whole birthday weekend. Note the irony, it was my mom's fault that the party got moved to the weekend that Kelly couldn't go, but my mom is still upset with her. As my family has grown, sisters married, children born, our traditions and routines have had to change. It took Kelly and I a while to get used to Christmas morning without all of us there, but we adjusted, and began creating new traditions. So the new tradition is for my sisters to drive down on Christmas day with their families, and then we have a big Christmas dinner and open presents late in to the night. Well, Katy mentioned that Brent feels bad about having they boys open presents, and then telling them they have to leave their presents and go to Grams & Gramps'. So Katy told me a few days ago that they may wait and come on the 26th. Well, I did not like this AT ALL!!! While things are never simple with my family and we are all heading in 5 different directions all the time, I'm sure the holidays will be fun as usual and we will all be glad just to be together, creating memories. Super Duper: NO CLASS ON MONDAY!!! officially put away all spring/summer shoes, sleeveless and short sleeve shirts, and capris, to make room in the closet for sweaters, boots, corduroy, you know, fall/winter gear! i'm uber excited because it's ice skating season!!! a friend of mine introduced me to google reader for keeping up with blogs that you read, and I LOVE IT (I highly recommend it)!!! I've started reading blogs from people I don't even know, like a girl who has quadruplets, and another one who had a baby born at 23 weeks...uber preemie. I don't know what it is, but I could read these blogs for hours! cleaned my car from the inside out, no trash, no junk in the trunk (literally), and no nasty grime on the outside!!! projected move date for the church offices is Dec 5-8!!!! I'll have 4 walls, a ceiling, and a door again!!! i've already started my Christmas list of what I'm getting everyone in my family (note: there's 13 of us now :O)!!! Gotta start now so I can spread out the spending! I just figured out that my projected graduation date from seminary is December '09...I know, sounds far away, but at least I have a goal, right? well, if a couple is 2 and a few is 3, then I'd say I surpassed my "few things" to fill you in on. That's the most of what I can think about for now. Super Duper: it's almost time for Christmas music!!! Super Pooper: the next 2 months are going to be MADNESS!!! Lillian and I at the top of the new Brooks Village Lookout Tower. Look close - that's Pat Neff in the background! This may be one of my new fave pic! This is the new Brooks Village mess hall. It's old school style and REALLY nice! Some people say it looks like Harry Potter, but I haven't seen any of the HP movies, so judge for yourself. 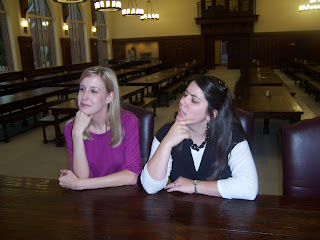 We thought for some reason that we needed to look contemplative in this picture, we're dorks, I know! 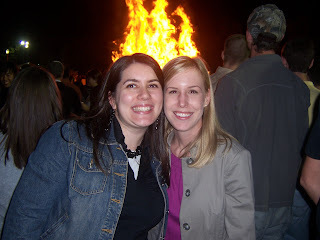 My dear friend Emily, obviously we're at the bonfire. Just one thing missing...our Lainey Di!!! 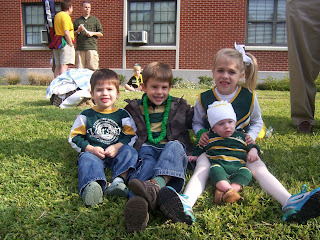 My niece, Ashlyn, and nephews, Blake, Brady and Cole (L to R)! 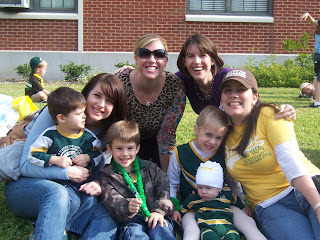 Yeah, they're all decked out for the Baylor Homecoming Parade! Don't get these group shots very often, and yes, we didn't manage to get everyone looking at the same time. But this is all 4 sisters and all 4 cousins, with one on the way!!! Sic 'em bears! 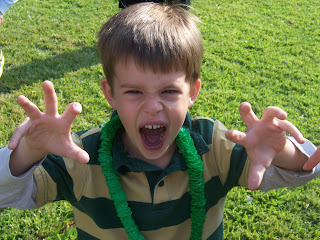 It's my brady boy being a ferocious Baylor Bear! Super Duper: Feel pretty good about the test I had today...and more importantly, ITS OVER!!! Super Pooper: please pray for my sister. They found fluid on the Baby's brain...this is no good. Could be a precursor for other complications. Please pray, I'll keep you posted! this is my attempt to get you to start a blog...START A BLOG!!! Super Duper: leaving for Baylor Homecoming tomorrow!